If you want to make sure that your DNS servers are working normally and returning the correct data, you can use our DNS advanced level of monitoring. Here is a quick guide how to configure your DNS targets in your account*. Select Host - If you already have the domain name or the IP address of your DNS server, you can select the appropriate host from the Select host drop down menu or you can enter a new host in the New Host text field. Port Value - The default Port value is 53 but if your DNS server uses another port, you can change that value. Name to look up - The most common way to monitor a DNS server is to check if it can resolve a specific domain name. In the Name to Look Up field, you can enter a domain name (www.example.com) that will be sent to your DNS server and you can check if it is resolved correctly using specific keywords. Query Types - There are several different Query Types for this type of check. The different queries will request different information from your DNS server. The A (IPv4 Adress) query type is the most widely used one. We will connect to your DNS server and request the IPv4 addresses associated with the test domain name. 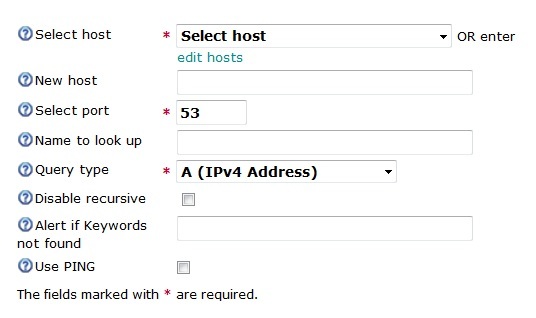 You can enter the correct IP addresses in the Alert if Keywords not found field, and if we get different or no values, you will know that your DNS server is not working correctly. 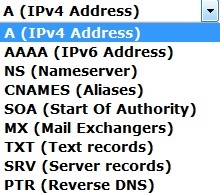 If you choose AAAA (IPv6 Address) as the query type, we will request the IPv6 addresses from your server. You can again use keywords to check if your DNS server returns the correct data. NS (Nameserver) records show which name servers will provide the DNS information for a specific domain. You can check if the correct name servers are responsible for the domain name in question. These records are used mainly for zone transfer purposes. NS records provide the names of DNS servers and not the IP addresses. The most important purpose of the NS record is to delegate parts of the domain to other DNS servers. You can delegate sub domains of your domain to specific DNS servers. CNAMES (Aliases) or Canonical Name records are used when you have different services running on a server using a single IP address (FTP and HTTP for example) using different ports. CNAMES can only point to a domain name and not an IP address. The biggest advantage of CNAMES is that if your IP address changes, you only have to change it in a single place. Start of Authority (SOA) resource record is the first record in any Zone file. Most SOA records contain the Source host, Contact email address, Refresh time, Retry Time, Expire time, Minimum TTL. MX (Mail Exchange) record points to the mail servers which accept the messages for a specific domain. It can also contain a priority value if more than 1 server is configured. Usually, the backup servers have lower priority and they queue the messages until the primary mail server starts working again. If your MX records are not working correctly, you will not be able to receive any emails addressed to your domain. You can basically enter any text you like in your TXT (Text records). The TXT records are mainly used to store SPF records. You can prevent spammers from sending emails faking your email addresses. SRV (Server records) contain the hostname and port number of specific servers used for services such as VOIP or IM. 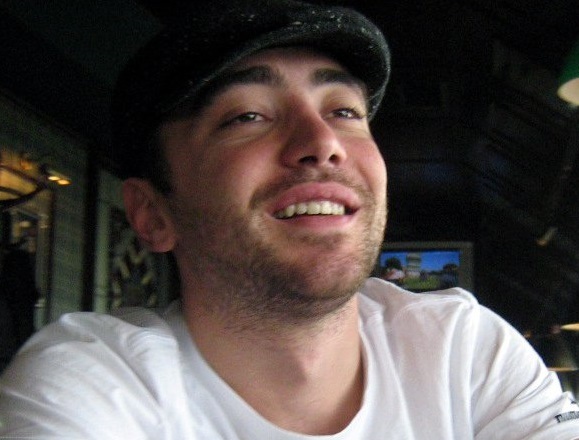 It allows the server to direct the requests to the right destination port. PTR (Reverse DNS) records do the exact opposite of what the A records do. The PTR records are mainly used to check if the IP address from where the connection was established is associated with the specific domain name. Most spam filters nowadays will actually do a reverse DNS to make sure that the email address is not used by an unauthorized third party. Disable Recursive - If you decide to use the Disable Decursive option, you will only get results if the specific DNS server is authoritative for the domain name you are looking up. *If you do not have an account with us yet, sign up for a 30-day free trial to test all our services absolutely free for one month.